Five cases featuring pairs of characters from the franchise will begin shipping next year. 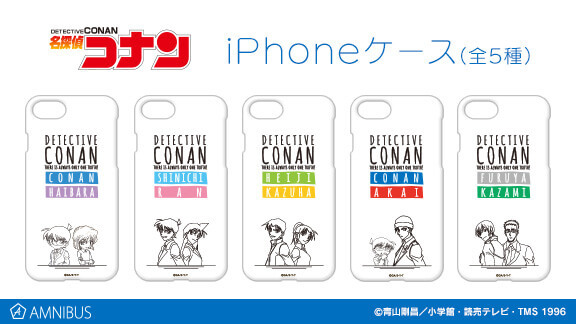 Five new Detective Conan iPhone cases have been announced. Alma Bianca is developing original merchandise that “is useful for everyday life.” As such, they are turning characters from Detective Conan into one of the most heavily used items in our present society: phone cases. There are five designs in total, each featuring the Romanized names of two characters from the series and line art portraits. Common to all of the models are the series title and its original tagline, “There is always only one truth!” All of the designs are on lightweight cases made of polycarbonate. The cases are all available for preorder from online shopping site Amnibus.com. This service only ships to Japan, so if you really want one and do not have access to an address in Japan, you will have to either use a forwarding service or try to obtain one second-hand. The cases are available for all iPhone models from the iPhone 6 through the iPhone X and will begin shipment in January of 2019.